Mac Lethal is a rapper. Since he’s also a white guy, people like to ask him if he wants to be “the next Eminem.” He’d rather be the first himself—a dedicated, verbose, and conscious rapper. He has a pretty good life—a nice house, a loving (if high-maintenance) fiancée from the right side of the tracks, and a career that’s well on its way up. Then Bennett shows up. Bennett is Mac’s cousin. He’s seventeen years old, spends most of his time stoned, talks like the ultimate gangsta, and claims to be “thirteen percent black.” He too is a rapper (albeit one with no skill), fixated on the worst “hos and bling” aspects of the genre. In short, he is everything Mac is not. He is also, however, family, and when family gets kicks out of its house and arrives at yours, its hazed-out mother and conspiracy-nut not-quite-stepfather in tow, you don’t leave it on the streets. Even if that would probably be a better idea than letting it stay. 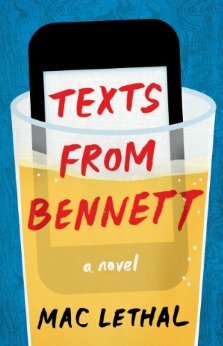 But if Bennett is real, then why is this book—also titled Texts From Bennett—a novel and not an autobiography? Is the author hedging his bets so as not to end up getting James Freyed? Either way, there is some sort of metatextual trickery going on: either we are reading a true story disguised as fiction, or else we are in an Adaptation situation, where Bennett (who is even given his own acknowledgments page at the back of the book) is an alternate personality invented by the writer. Whichever is the case, it’s not exactly successful. What was riotously funny as a single-serving blog becomes only intermittently amusing (and occasionally downright wearying) when dragged out to 300 pages and wrapped in a narrative. (And it’s not much of a narrative--many of Lethal's songs pack more story into three minutes.) If the book were presented as autobiography, I might be more forgiving, but since it isn’t, I found myself wondering why I was supposed to care about anything going on. Texts From Bennett isn’t terrible—it’s just pretty dull.